The writings of the Church fathers affirming the Reformation principle of sola Scriptura, Volume 3 of 3. Edited by David T. King and William Webster. The principle of sola Scriptura -- the teaching that Scripture is materially and formally sufficient and the ultimate authority for the Church -- was the formal principle of the Reformation. The Roman Catholic Church teaches that the principle is illegitimate because, she claims, it is unhistorical. By this she means that sola Scriptura is a theological novelty in that it supposedly has no support in the teaching of the early Church. Roman apologists charge that the teaching on Scripture promoted by the Reformers introduced a false dichotomy between the Church and Scripture which elevated Scripture to a place of authority unheard of in the early Church. The Church of Rome insists that the early Church fathers, while fully endorsing the full inspiration of the Old and New Testaments, did not believe in sola Scriptura. This volume is a compilation of the teaching of the Church fathers on the primacy, sufficiency and ultimate authority of Scripture. 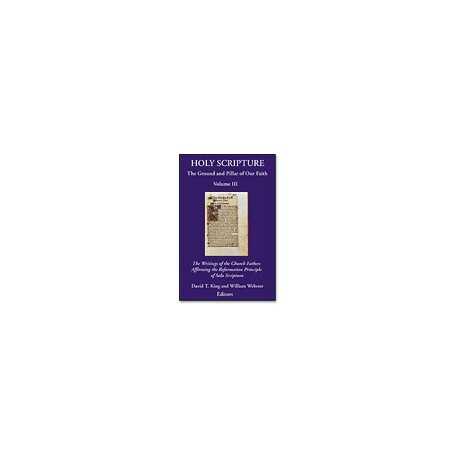 It contains one of the most extensive documentations of the patristic understanding of Scripture in the English language brought together in one volume. The editors have gone to great lengths to provide the primary sources where the quotations can be found in the original works, where appropriate. The documentation provided reveals in the clearest possible terms the Church fathers' belief in the material and formal sufficiency of Scripture. By material sufficiency we mean that all that is necessary to be believed for faith and morals is revealed in Scripture. Formal sufficiency means that all that is necessary for faith and morals is clearly revealed in Scripture, so that an individual, by the enablement of the Holy Spirit alone, can understand the essentials of salvation and the Christian life. Page after page gives eloquent testimony to the supreme authority that Scripture held in the life of the early Church and serves as a much needed corrective to Rome's misrepresentation of the Church fathers and her denigration of the sufficiency and final authority of Scripture.